The Effisus solutions combine, in an innovative and balanced way, Efficiency and Sustainability, promoting integrated systems with high added value and superior quality. Roof and facade integrated solutions for sealing, waterproofing, thermal and acoustic insulation that will generate superior building energy efficiency. 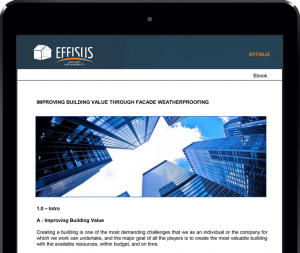 Effisus provides “Building Envelope” solutions (water, air, heat, light and noise) to maximize performance and lifetime of buildings. Supported by our extensive consulting services, we offer a wide range of solutions and systems for roofs, facades, interiors and foundations. Why should you choose Effisus?